One of the questions many health systems ask when considering telehealth is whether the patient will use the service. To help health systems answer that question, American Well conducted a nationally projectable survey in 2017—a telehealth patient satisfaction survey—to measure patient perception and experience with telehealth. Here is a summary of the results of the 2017 survey. For a more in-depth look, read the full eBook. During the survey, patients were asked if offered the following three options – video, telephone and email – which method results in the most accurate diagnosis by a doctor? 69% of respondents said that video results in the most accurate diagnosis. Patients also said that video visits effectively solve their health concerns. In fact, patients reported that their healthcare concerns were completely resolved 64% of the time when in a brick and mortar setting. 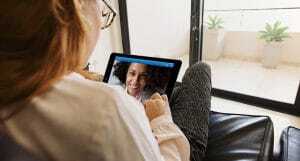 Data from American Well’s telehealth service shows that patients were able to resolve their healthcare needs 85% of the time with video visits. Whether for relatively simple concerns like prescription refills or major ones involving chronic disease management, patients want telehealth. 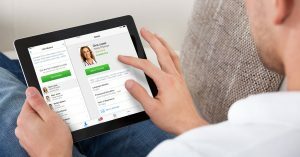 In fact, one in five patients said that would switch to a new doctor if they offered telehealth. This type of demand is especially relevant in rural areas. Growth in this area is so large that recent FCC proposals include funding for telehealth equipment in rural clinics to the tune of over $400 million just in the current fiscal year. The telehealth patient satisfaction survey also found that patients are delaying healthcare. Two-thirds of Americans have put off consulting a healthcare professional for a variety of reasons ranging from cost to access. Patients aren’t just delaying care for minor issues. Nearly a third of patients who said they had delayed seeking care are facing a serious health issue. Delaying care for serious health concerns can have costly ramifications for the patient and the healthcare provider. The telehealth patient satisfaction survey also found that two thirds of consumers are willing to see a doctor over video. Access and time saved are two things that are driving patient willingness to see a doctor over video. In a study by Southwest Medical Associates of Las Vegas, standard doctor visit times started with 18 days between making the appointment and seeing the doctor. The in-office visit itself took about two hours, only 20 minutes of which involved face-to-face time with the physician. With telehealth, the study found patients spend approximately five minutes waiting and 8-10 minutes seeing the doctor—a drastic increase in time saved compared to in-person visits. 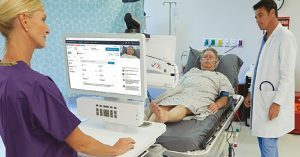 The telehealth patient satisfaction survey revealed that patients want telehealth and may start going to the healthcare professionals who offer it. To learn more about patient sentiments toward telehealth, read the full eBook.